Why Is My French Bulldog Itchy? Is your Frenchie chewing and scratching all of the time? Despite our best efforts to keep our pup’s clean, healthy, and free from allergens, being itchy is all too common for French Bulldogs. There are a number of reasons your Frenchie might be so itchy – knowing what to look for and how to treat the symptoms can make your pup’s life much more enjoyable. They are likely very uncomfortable if they are always scratching! Unfortunately, French Bulldogs are notorious for developing allergies which result in the dreaded itch and they can be really tricky to diagnose. Let’s take a look at the different types of allergies you should be aware of. By virtue of their breed, French Bulldogs are genetically predisposed to many common allergens in the environment such as dust, plants, trees, chemicals (such as in basic household cleaners) and other common causes of allergies, just as with humans. They are smaller than most breeds and have very short hair which can provide less protection to the outside allergens. Atopic dermatitis is a common skin rash that appears usually after the age of three months. Symptoms include inflammation of the ears, underarms, belly and any exposed parts of your dog. Increased histamines will cause your pup to scratch and chew at the affected areas. Also as with humans, French Bulldogs can be allergic to certain foods and additives. Symptoms are similar to environmental allergies and can include inflammation, redness, and swelling of areas on the body. Other common symptoms of a food allergy will include gastrointestinal symptoms such as diarrhea, flatulence, and vomiting. Skin allergies that are left untreated can result in skin infections and sores as well as other more serious conditions. Most popular brands of dog food have ingredients such as poultry, beef, pork, dairy, soy and corn which can all be causes of the allergic reaction. A simple way to begin the search for the culprit would be to eliminate one type of food at a time and see if the symptoms subside or disappear. After 7-10 days if a certain food is the cause of the issue, you should see relief from the symptoms. The very first thing to do when your dog begins to show allergic reactions of any kind is to consult your vet. He/she can assess the symptoms as well as your dog’s routine and help to find the cause. Your vet may also run blood and urine tests to get specific information about your puppy’s health. If there are sores or lesions, the vet will probably also do a light scrape of the area to test for specific types of bacteria. It’s extremely important to follow the veterinarian’s instructions carefully. Usually, this will include keeping them very clean, especially their paws, face, and belly which are the closest point of physical contact to most environmental allergies. Be careful not to over bathe your Frenchie as this can cause their skin to become dry and even more irritated. The vet will probably suggest a hypoallergenic soothing shampoo. If there is any type of infection, they will probably also prescribe an antibiotic. 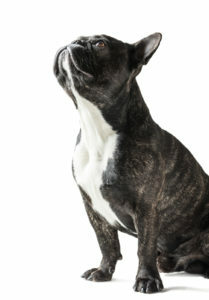 One popular allergy maintenance solution for Frenchies is to feed them chewable allergy supplements. Our pick is the Zesty Paws Allergy Immune Bites, a product with a whopping 650+ positive reviews on Amazon. These bites are chewable grain-free treats that contain digestive and immune-boosting ingredients to promote a healthy response to food, skin, seasonal, and environmental allergies. The most important thing to remember is that your French Bulldog will bring you years of happiness, loyalty, and companionship. The possibility of allergies should never restrict your decision to give this dog a loving home. Any dog can develop allergies to anything. French Bulldogs are just predisposed to many allergens and as a responsible dog owner, it’s good to become informed so you can take the best possible care of your dog! Most allergies are easily manageable with proper care and attention.